Since their demise in 1972, Audience members have teased their fans by reconfiguring themselves several times down the years, but never quite re-forming. That changed in 2004, when the quartet reunited for a clutch of English gigs, shows so successful that the group decided to make their re-formation permanent. 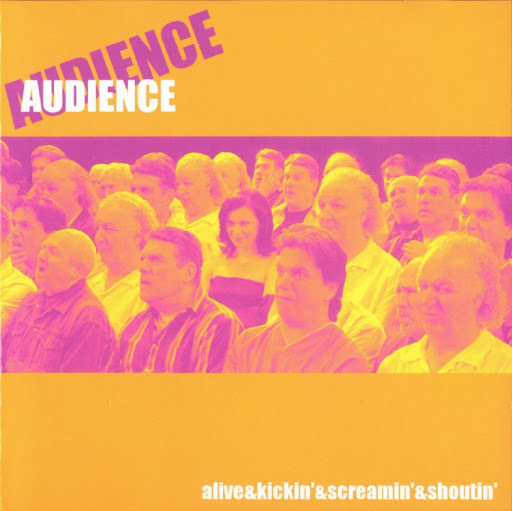 Alive & Screamin' & Kickin' & Shoutin' was recorded during this tour, capturing their gig at the Astor Theater in the southern English seaside town of Deal. The group's pleasure at being on the stage together again is evident, celebrating their past with a set of their own songs and covers. Half the tracks -- five songs -- are classic Audience numbers drawn from their first three albums. The hauntingly bluesy "Zig-Zag & Swirl," though, is a new one for the band, but not for Howard Werth; it's featured on his third solo album, The Evolution Myth Explodes. Also on that set was a cover of Lennon and McCartney's "I Wanna Be Your Man," which Audience now further reinterpret to great effect. Equally evocative is a stirring version of "Morning Dew," as well as an inspired take on James Brown's "The Bells." The group's bluesy styling reaches its apotheosis on "The House on the Hill," and across this nearly ten-minute extravaganza, they subtly glide in and out of funk, prog, folk and jazz in an homage to all that made British prog so breathtaking at its height. A superb show, and a welcome return for a sorely missed band. Werth, Williams, Gemmell and, instead of Tony Connor, John Fisher on Drums.